This is just one of my favourites. It’s only little, 6×6″, but like most fractals it took a long time to paint. So many tiny little fried eggs! It’s framed in a black lacquered shadow box frame so that it floats in the frame. The total size, frame and all, is roughly 12×12″. Yet again, we see a natural shape. Well, natural, in that we are natural and we naturally like to fry eggs. Sometimes I find that it isn’t so much the repetition on smaller and smaller scales that makes me think of natural objects or phenomena when I look at fractals, but the shape that is being repeated. As usual, it’s copyrighted and watermarked. 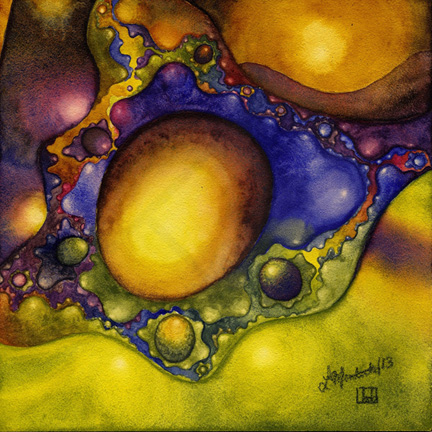 This entry was posted in Art, Fractals and tagged aquabord, art, eggs, fractal art, fractal geometry, fractals, fried eggs, Lianne Todd, mathematics, modelling of nature, natural forms, Paintings, The Fractal Nature of Our Universe, Watercolors, Watercolours by Lianne Todd (artist). Bookmark the permalink.